Zonulin is a protein, synthesized in intestinal and liver cells, that reversibly regulates intestinal permeability. Zonulin modulates the permeability of tight junctions between cells of the wall of the digestive tract. It was discovered in 2000 by Alessio Fasano and his team at the university of maryland school of medicine. The classic symptom of cholera is profuse, watery, debilitating diarrhea. One of the bacterial toxins associated with cholera, called zonula occludens toxin, rapidly and reversibly opens the tight junctions between intestinal cells, temporarily causing leaky gut. Dr. Fasano and his colleagues found that cells in the human intestine produce a protein that is almost identical to the zonula occludens toxin, and they named it zonulin. Dr. Fasano’s group then isolated zonulin from human intestines and found it to increase intestinal permeability in primates. Leaky gut, or “intestinal permeability,” is a condition in which the lining of the small intestine becomes damaged, causing undigested food particles, toxic waste products and bacteria to “leak” through the intestines and flood the blood stream. The foreign substances entering the blood can cause an autoimmune response in the body including inflammatory and allergic reactions such as migraines, irritable bowel, eczema, chronic fatigue, food allergies, rheumatoid arthritis and more. Zonula occludens toxin (ZOT – R) is one of the toxins released by Vibrio cholerae which cause the severe diarrhoea experienced by those with cholera, and acts by loosening the tight junctions of the gut. As these weaken, water can rapidly flow back into the gut putting sufferers at severe risk of dehydration. When studying this toxin, researchers identified that there was a human analogue which our own gut cells could release in order to regulate tight junction structure and function, which they named zonulin (R). Importantly, zonulin remains the only modulator of intracellular tight junctions expressed so far that can affect gut function and health and associated immune response and so it is widely investigated. High levels of zonulin have been associated with increased intestinal permeability, as zonulin induces the breakdown of the tight junctions between intestinal epithelial cells. Several autoimmune, inflammatory, and neoplastic diseases have been associated with elevated levels of zonulin or evidence of increased intestinal permeability. These include celiac disease, type 1 diabetes, and juvenile nonalcoholic fatty liver disease. In addition, evidence is accumulating to support an association with multiple sclerosis, rheumatoid arthritis, asthma, and inflammatory bowel disease. When we say that zonulin increases intestinal permeability, it is helpful to think of the lining of the intestines as like a cheesecloth. Only the tiniest particles should pass through. Zonulin makes the holes of the cheesecloth bigger and allows large particles to pass into the bloodstream and through the body. We call this increased intestinal permeability, or leaky gut. The process of leaky gut is thought to contribute to inflammation throughout the body and even to the development of autoimmune disease. Consistent with the theory of leaky gut and autoimmune disease, excess zonulin production is found in a variety of autoimmune diseases. It is also found during flare-ups of celiac disease. Whether a person has an autoimmune disease or not, the 2 most important triggers for zonulin release are bacteria and gluten. 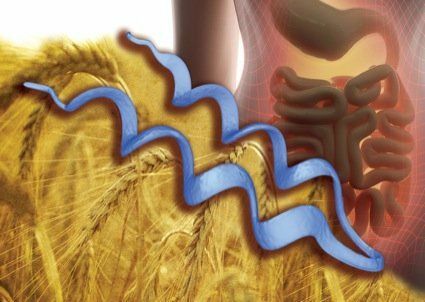 Even in people who do not have celiac disease, the gluten and gliadin proteins that are found in wheat can trigger the release of zonulin and increase intestinal permeability. Creative diagnostics provides high quality zonulin elisa kits for the quantitative determination of human haptoglobin concentrations in serum-free cell culture supernates, serum, plasma, saliva, and urine. It is only for research use.